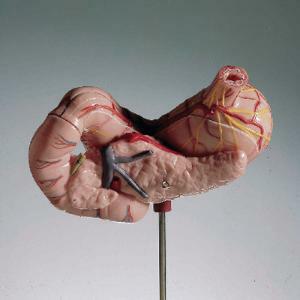 This life-size stomach model has a portion of the duodenum and pancreas attached to show how the organs work together in the human system. Your class can study the interrelationships with the model as a whole, then separate the three parts to study each one individually. The stomach and pancreas are dissected to show their inner structures; the pancreatic ducts are shown in relation to the duodenum. Vessels and nerves are also shown, as are the layers of the stomach wall. The three-piece model is mounted on a base and can be removed for closer study.